Sometimes I’m surprised to see what light novels have already been translated by fans. I had become aware of Kokuhaku Yokou Renshuu (AKA “Confession Rehearsal”) some time last year, but did not think to try searching for a fan translation until a couple months ago. As it turns out though, there is a translation available–and overall it’s a good one too. At the very least, it reads smoothly and most of the dialogue sounds natural. Similar to Kagerou Daze and a number of other light novel series in Japan, Confession Rehearsal is based on a series of Vocaloid songs. I am not familiar with them, so I can’t comment on how this book works as an adaptation or expansion of the music. But it’s an interesting sort of cross-media promotion? On to the story itself, Confession Rehearsal is about as straightforward as it gets for a shoujo high school romance. Our protagonist Natsuki (a girl in the art club) has fallen for her childhood friend Yuu (a boy in the film club). She manages to confess to him… but gets cold feet and rescinds her declaration. That was actually a confession rehearsal, she explains, and she won’t give away who she intends to give the real confession to until she’s built up the courage for it. How awful! Especially when it turns out Yuu actually likes her too, but isn’t going to confess now that he’s under the assumption Natsuki likes someone else. As can be expected, the web of misunderstandings grows all the more tangled when other friends enter the game of romance, and things play out the same sort of way they would in a volume or two of a shoujo manga. There isn’t a lot to delve into for this one. I found the characters easy enough to relate to (i.e. they’re very normal), and there’s a cute and fluffy atmosphere to it all that makes Confession Rehearsal a quick and easy read. 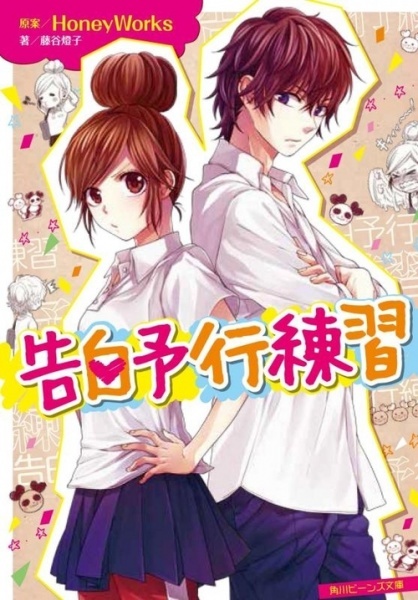 I also liked the portrayal of the two school clubs, and the everyday struggles the main characters face in dealing with some personal issues related to them. My main complaint is that the book’s ending felt rather sudden–or more specifically, while the main storyline played out okay, all the other subplots seemed to just fall off the face of the Earth. I’ll have to assume the side characters will all be dealt with in subsequent volumes (A Solution for Jealousy, etc). Regardless, I’d still say this volume’s worth checking out, so long as you’re a fan of the genre.